How to make ghee from butter at home quickly and easily. 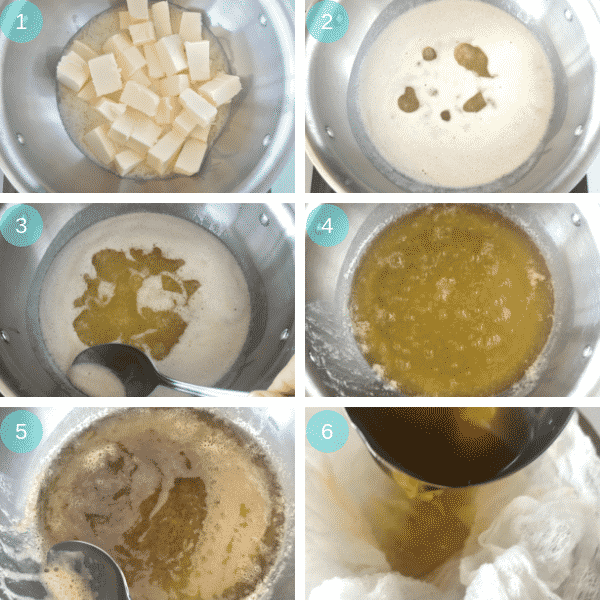 This is a step by step guide for quickly clarifying butter to get this heavenly golden liquid. 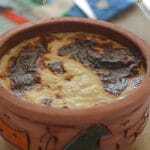 Ghee is a key ingredient in many dishes in the Middle East, especially desserts. 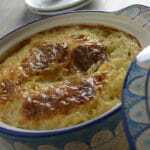 Take for example this basbousa recipe, yes you can make it with butter but ghee takes it to a whole new level. Learn how to make ghee from butter quickly unlike the traditional way which required hours of simmering over a very low flame. This post has been updated from the original December 2012. Last updated February 2019. Making ghee from butter is a skill that has been in families for generations. I love ghee. In the Middle east almost every little girl has seen her mom making ghee many many times. It is an essential ingredient in many authentic Middle eastern desserts. It adds its own touch to dishes regarding smell and taste. In Egypt we usually make ghee out of white butter not yellow one, but I love it either ways.The idea behind making ghee is clarifying the butter, taking away the dairy solids in it to end up with pure butterfat. 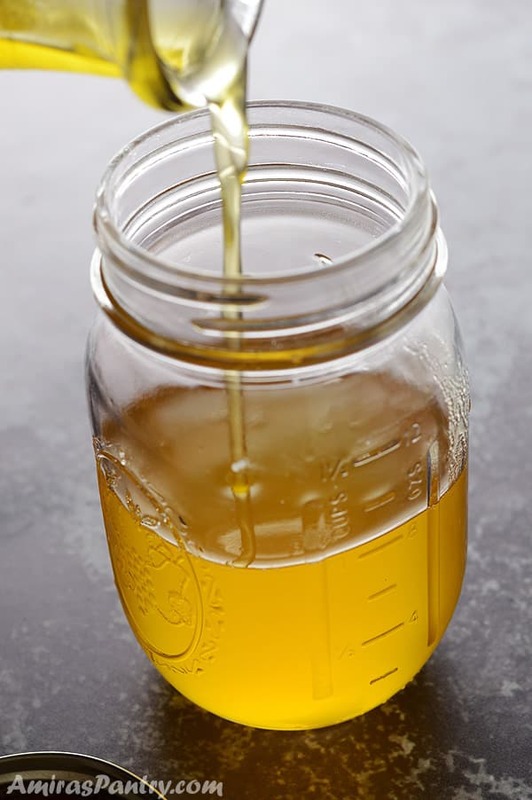 The traditional method of making ghee is by melting butter then reducing heat as low as possible keeping the butter there until it is completely clarified and the solids sink to the bottom turning a little brownish. This process usually took around 3-4 hours depending on how much you are making. Today, though I am going to show you a way that will only take 30 minutes of your time and the result is a delicious, nutty flavored butter each time. Ghee is simply clarified butter with all the milk solids and proteins removed. It has an incredible butterscotch flavor which blends beautifully in mostly any dish you make. Ghee is a staple ingredients in the Indian cuisine as it is in many of the Middle Eastern dishes. Ghee has a high smoking point which makes it a great candidate fat for stir frying and roasting recipes. The answer depends greatly on your dietary needs. 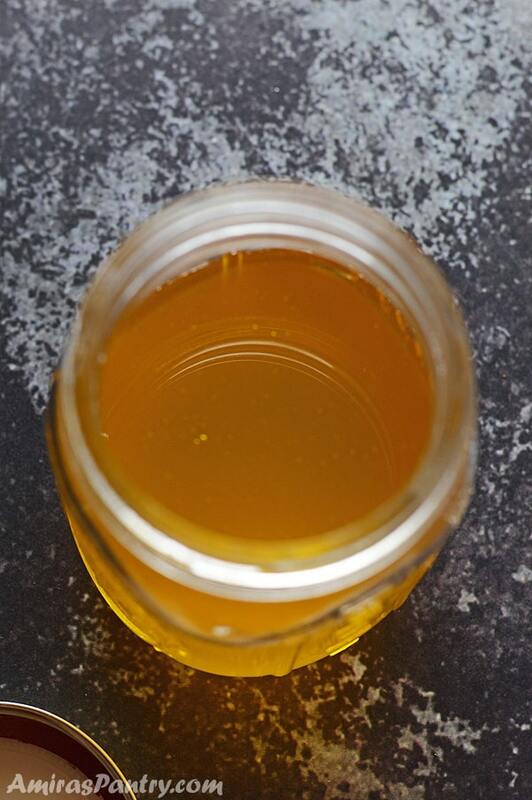 Ghee is a very good alternative for people who follow a whole30, Paleo diet or who have light dairy sensitivities. On the other hand, if you are watching you calorie or fat intake butter is slightly lower than ghee in both. How much ghee do you get from a pound of butter? A 1 pound of butter = 2 cups = 4 sticks usually yields 1.5 cups of ghee. How long does homemade ghee last? How about FOREVER!!. Guys I’ve seen my grandmother melting around 20 kilograms of butter all at once, pouring them into these giant glass containers and just storing them in the back of her pantry… she did not refrigerate!!. It is recommended though, that ghee can be stored for up to 1 year refrigerated and 3 months on the shelf. Can you clarify salted butter? Yes and No. Ghee from salted butter will be salty and you will not be able to use it in desserts. Although I’ve seen my mom and grandma adding just a dash of salt to the butter while making ghee, and I will tell you why by the end of the post, this dash did not make the ghee salty. Before you start melting butter, it is always easier and quicker to cut butter into small cubes to shorten melting time. Add butter to a heavy bottomed pot over medium low heat. After about 5-8 minutes you’ll notice that the butter is melted and it started foaming. This foam is the milk proteins separating from the fat and water and rising to the surface of the pot. Using a spoon remove foam from the surface of the melted butter. Keep doing so as much as you can until the surface clears. At this stage you’ve got yourself clarified butter. You’ll notice some milk solids sinking at the bottom of the pot. This would probably take anywhere from 20 to 24 minutes. To achieve that nice flavor, we will raise the temperature a bit to probably medium and watch the pan like a hawk. This stage will take probably from 3 to 5 minutes to slightly brown the milk solids at the bottom of the pan. Watch the pan carefully as it can burn easily. Skim any bubbles at the surface so you can see clearly. Let the ghee cool down slightly for a couple of minutes then strain carefully through a fine mesh strainer lined with cheese cloth. 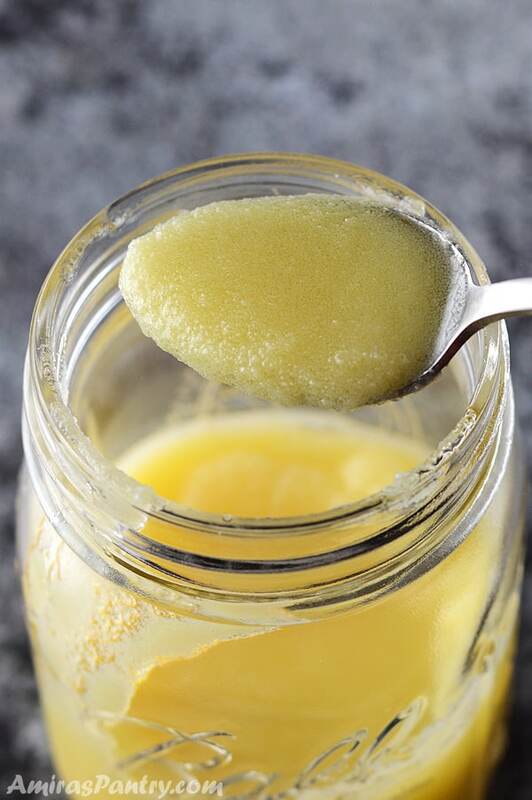 Pour ghee into clean glass jars. Let it cool completely before putting the lid on. The ghee will solidify on room temperature. When making ghee, it is better to use light colored pot like stainless steel or dutch so you can see the bottom of the pot clearly. Ghee will have a strong butterscotch note to it. It might seem very strong in the beginning but it will fade slightly as it ages for 2-3 days. It will eventually come to a balanced rounded nutty flavor. Now for the browned solids at the bottom of the pan. Here is what my mom and grandma did. They took these solids and use it as a spread for crusty bread, they might add a little extra dash of salt to it but seriously guys they taste heavenly. This is called “Morta”. Another tip I got from a friend is, you know the foam that we skimmed on step 3 above? Do not discard, instead brown them a bit in a pan and use it as a “Morta” spread. Another way to use the browned solids is to add them to some flour and honey and make a sort of fudge. You can use ghee pretty much as you would use butter in everyday cooking. Here are some of the recipes that uses ghee here: Mediterranean rice, Basbousa, Egyptian Cookies, Egyptian rice, Stuffed grape leaves and sadd el hanak. You might want to check how to make ghee in the instant pot. 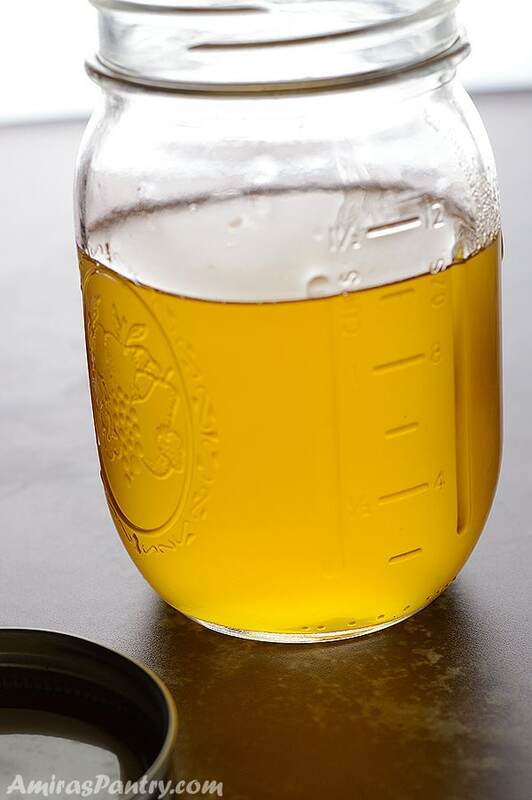 A delicious and flavorful sort of clarified butter that will take 30 minutes to make and takes any dish you make to the next level. 1 pound 453 gm/ 2 cups unsalted butter, cut into half inch pieces. You’ll notice that the butter will melt after about 8 minutes and starts to foam. Use a spoon to remove the white foam that will rise to the surface. The butter will clarify and some of the milk solids will sink to the bottom after about 20-24 minutes. Raise temperature to 240F -250F and wait until the solids at the bottom of the pan turn golden brown. Keep an eye on the pan as this will probably take anywhere from 3-5 minutes. Note1: Use a light colored pan like stainless steel as it makes easier to notice the butter as it burns easily. Note2:Please be extremely careful as the ghee will be vey hot and can burn. Question about the ghee….when skimming the white foam that rises, do I do that only in the beginning or throughout the 4 hours? Lauren, I am sorry for your early loss :(, it is hard. I am happy though that you’ve found my blog helpful. If you need any recipe please do not hesitate to ask. 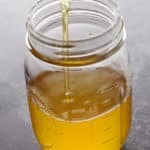 For the ghee, it will foam mostly in the early stages afterwards it will start to clarify and there will be so little foam which you can discard if you feel the need to. How much samn do you get from the 4 pounds of butter more or less? I don’t care about exact quantities, just a general idea would help inshaAllah. Thanks for stopping by . Usually I get from 5-6 cups of samn from a 4 pound packet of butter.